Red Gun Firearm simulator urethane replica for law enforcement and military training. ASP Red Guns are realistic, lightweight replicas of actual law enforcement equipment. These training guns are ideal for weapon retention, disarming, room clearance and sudden assault training. ASP Red Guns fit in holsters and have the exact look and feel of the real equipment. Select your training gun model from the drop down list. 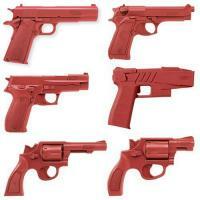 We also carry a large selection of red gun assault models and accessories. Great training aids, good weight for simulation.